This year could hardly have started worse, with financial and actual storms. The collapse of Carillion sent shockwaves through UK infrastructure and revived long-running grumbles about the viability of some of the profit margins in our business after which the Beast from the East brought severe weather at the end of winter. However, just as many in Carillion’s well-respected highways department have gone on to find other work, and just as the roads projects the firm was involved in have continued, albeit with some delays and cost increases, the roads sector ends 2018 on something of a high. This was the Year of Engineering of course, and it was fascinating and inspiring to hear some of the diverse stories of people who have flourished in our sector, especially those who overcame physical and mental health issues and serious disabilities. While we are rightly concerned about a lack of diversity in this sector – especially given the need for qualified engineers – we should also recognise that we are very often an inclusive sector that is ready and willing to make people feel at home. The stories we raised in this magazine were often triumphs of individuals but they also reflect the character of the people around them. One shame from this year has been the ongoing difficulties and, frankly, failures of the Government’s Apprenticeship Levy. Government needs to do more to support this industry – one in which the UK is a world leader and which is essential to the autonomous and connected vehicle industries that the Government wishes us to also lead in the future. While Highways England may be playing it down, the Budget, and its outline spending for the second Road Investment Strategy of £25.3bn, was a huge success. Talk of a potential local RIS is also music to the sector’s ears. While roads departments struggled heroically through austerity, refining asset management and developing the risk-based approach to support them as they went, the enforced cutbacks and false economies are bound to have a breaking point. The fact that the Transport Select Committee has launched an inquiry into the governance and finance of local roads is a big step in the right direction and shows that Parliament is starting to listen and the calls can only get louder. As Highways has reported, a range of options have been suggested; some include cutting the number of highway authorities, moving the sector to a utilities model, creating greater regional working, or even taking authorities into special measures as one might for social care departments. It would be foolish to expect change to happen overnight or suggest it should. Whatever option is recommended by MPs in the end, it will require political will and leadership to make it happen and to make it a success. One thing is for sure, it takes great skill to maintain a complex and busy road network like ours and it costs a lot. There is no getting away from it. At the start of the year, we also saw confirmation of the major road network (MRN) plans and indeed the first five schemes of the soon to be announced map were released this autumn. While the blueprint for the MRN was not as expected,or hoped for, by many – in that it did not include the strategic road network and there has been no money set aside for maintenance – we have been assured by DfT officials that it will develop beyond the ‘billion for bypasses’ tagline it seems to have developed. Under the MRN system, local authorities will submit proposals for projects of between £20m and £50m to sub-national transport bodies, which would then get sign-off on selected schemes by the transport secretary. This gives STBs a chance to shine in the highways sector, providing a strategic, multi-modal regional vision that is often badly needed. By the spring we had the familiar ALARM survey into local authority highways maintenance; however this time it produced some unfamiliar results. Having hovered around £12bn for many years the estimated highways maintenance backlog fell by 23% to £9.31bn. While this is still a huge number that demonstrates the Government’s dramatic underinvestment in what is our most valuable physical asset, the improvement is testimony to the impressive work of councils and their partners and the ongoing progress towards asset management. In the summer, an exclusive Highways survey in partnership with the FiTZINDEX, revealed the depth of concern over procurement in our sector. The vast majority felt it was actually driving more risk adverse behaviours; only one in five felt it was servicing the needs of the sector well or very well and only around one in three felt it showed any signs of evolving from one contract period to another. At the same time, this year has seen the NEC4 Alliance Contract published; the Institution of Civil Engineers launched Project 13 to help change the culture and develop a more collaborative model; and Highways England launched its Regional Delivery Partnership frameworks, which will handle £8.7bn of work under a very new model. Highways England will be moving away from individual bidding – something called for by contractors themselves – towards a more performance-based assessment. The takeaway point was that some contractors ‘have a reason to be nervous’. The judgement may well get tougher, but it should get fairer as well. The autumn saw the new code of practice come into force. Much of what was happening on the ground might well not seem to have changed dramatically…yet. However the sector is waiting for the first court cases and the first signs that some authorities are putting the risk into the risk-based approach. In any case, the responsibility for policy now rests with the authorities themselves, so the change is as radical as the sector chooses to make it. Other ups and downs saw a very successful Highways England media campaign against tailgating capture a place in imaginations and news cycles. However we also saw Highways England fall behind on the promised release of the results of the star rating survey of the strategic road network and its Passport system for worker safety. A pledge to deliver an interactive map of works connected with designated funds also appears to be somewhere in between production and the long grass. In terms of schemes this year we saw progress both on the strategic and local level. 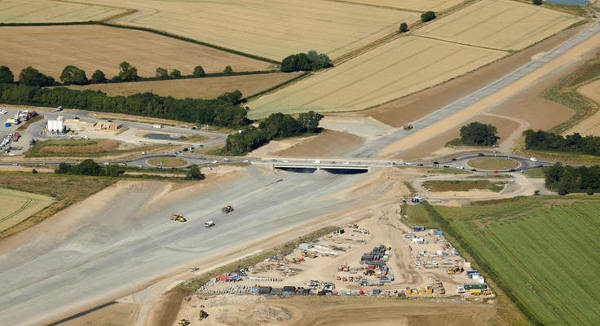 In Scotland the A9 dualling pushed forward, in England we saw the long-awaited opening of the £205m Norwich Northern Distributor Road - despite its many setbacks and much bad luck - and the £1.5bn A14 (pictured above) scheme has made fantastic progress. The country faces much uncertainty next year and this sector especially may well be seriously impacted by Brexit, with much of our staff made up of European workers as Highways exclusively revealed back in the spring when we published previously unreleased Highways England analysis. However, a greater emphasis this year on joint and several contracts prompted by Carillion, and on collaboration, means we have put ourselves in a better position to tackle the issue. In the last analysis, we have done better out of 2018 than might have been expected, certainly at the start, and have the potential and the foundations in place to see the sector progress and transform next year. Arguably the problems that we faced this year have been the same problems we have faced for some time and the sector is more aware, better prepared and has a louder voice than before. Perhaps the thing we should fear the most is fear, for there are many opportunities ahead.